According to Wikipedia, a mulligan is second chance to perform an action, usually after the first chance went wrong through bad luck or a blunder. Well, I’m taking a mulligan on my exercise routine! I was pretty faithful to my favorite activity of walking, recording with my Fitbit and using an app on my phone to track my activity. Then, “life” happened…I got busy with work and family and holidays, etc. and my exercise routine suffered. I failed to keep it a priority. But, the New Year happened last Thursday, and I decided to “take a Mulligan”. I’m starting over. I’ve walked outside everyday this year! But, walking outside can be pretty cold! Fortunately, there is a small college in my town and they allow the general public to utilize their fitness facility with a great walking track. I like to go there. If you’re not in a similar situation, consider other options available to you, such as walking in a large Home Improvement or Warehouse type store. Think about walking in a hospital, and using the stairs between each floor. Go to an indoor shopping mall, just pocket your cash for now. Look for other climate controlled opportunities in your area. Of course, there’s always indoor fitness equipment to purchase, if you want to do that. Always check with your doctor before beginning any exercise program, but especially if you are considering heading outside during these cold winter months and have certain conditions, such as asthma, heart problems or Raynaud’s disease. Check the forecast. The wind can play a major role in staying warm. Avoid the inclination to overdress. 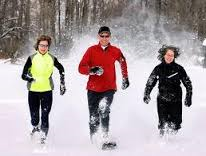 Exercise will generate heat, so dress in layers that you can remove as you warm up. Otherwise, you’ll get too hot, then perspiration will begin to evaporate and you will feel too cool. Look for base layer fabrics designed for winter workouts. Fabrics that wick away moisture will keep you dryer and warmer. Protect your head, hands, feet and ears. These extremities get cold because blood flow is concentrated in your core. Call a friend to go with you for support and accountability. Writer: Kathryn K Dodrill, Extension Educator, Ohio State University Extension, Washington County. Reviewer: Michelle Treber, Extension Educator, Ohio State University Extension, Pickaway County.